Whilst attending Buddhist ceremonies in Tokyo and surrounding areas I was delighted to find that I remembered some of the Heart Sutra (important Buddhist chant), and my spirit danced to the rhythmical cadence. I felt 'in sync' and in rhythm with the people. My translators and guides affirmed this by praising my flexibility and saying that it felt like I was Japanese. This warmed my heart. After spending 18 years studying Sangoma medicine (African Shamanism) in my homeland, South Africa, it felt like a return to my spiritual roots, practicing in Japan. This helped affirm my conviction in our common human roots and how all spiritual disciplines are pointing in the same direction i.e. nature, transcendence, harmony and peace. Japan is a wonderful mix of modern (Western) and traditional (Japanese) culture. Tokyo is by far the most serene and peaceful capital city that I have worked in so far. As I walked from my apartment near the French and German embassies, I experienced a sensory overload from my toes to the crown of my head. The heat was almost physical and it felt like I was walking in the karoo (semi-desert) in South Africa during a mid summers day. My ears were filled with the sound of cicadas chirping in a feverish way. They are called 'semis' in Japanese and only live for 24 hours. This seemed to encapsulate the intensity of their spirits, and made me appreciate the gift of life while I meandered through the streets of Tokyo. I was struck by an ancient Shinto temple shouldered against the side of the road only minutes away from my new home. People stopped and bowed reverently. Life stood still. I approached the temple and felt a sense of awe and serenity like I experienced in many old Buddhist temples in South Korea. A lion sphinx like creature stood guard as you crossed over the threshold and entered the temple grounds. Apparently it is suppose to be a fox. The night before I dreamt about a large fox in red that seemed to welcome me and 'opened the road for me'. My Japanese translator and friend said this was a good sign. The fox represents the spirits of nature in the Shinto faith and is highly revered as a guardian spirit. I was shown how to clean my hands with water before approaching the shrine. People wash both hands in a mindful way and take a sip of water. The water fountain bubbled up and appeared in a shrine like structure with wooden cups used to collect the water. The cups had ancient Japanese writing inscribed on them and the surrounding water fountain. We then walked up a short flight of wooden steps clapped our hands and bowed a few times. This was to summon the nature spirits and bowing demonstrated humility. I watched people standing in stillness around me while they prayed quietly and focused their awareness on the shrine ahead. We bowed again, clapped and turned away from the shrine and left the temple grounds. The Japanese Shinto tradition is very similar to the Sangoma tradition in Southern Africa. As Sangomas we revere our Ancestors in terms of the 'Izinyanya', meaning the 'silent hidden ones' or spirits of nature. We have intricate ceremonies in the forest, near the sea, lakes and rivers where we pay homage to the spirits of nature in all it's forms. The same spirit of reverence and awareness is seen by Japanese people who practice the Shinto faith. Sangomas always honour their blood ancestors who act as guardians and gatekeepers to the spirit world. The same could be said for the Shinto faith, which is one of the oldest traditions in Japan and most people practice it alongside their Buddhist faith. It rests on honouring one's ancestors and nature spirits. I found this incredibly similar to my own Sangoma practice. My Japanese clients and workshop participants had no problem understanding my speech about honouring ancestors and nature spirits. A number of them experienced powerful healings and dreams from the ceremonies they attended with me. My only advice or 'indaba' (spirit news or message) to them, was to remember their ancestors and the old traditions of their people. In this way It felt surprisingly similar to back home in South Africa, where I say the same thing to my countrymen from different Sangoma lineages. Modernisation is wonderful in making our lives easier through the use of mobile phones and computers. However, we have a responsibility to also be mindful of where we come from and remember our spiritual traditions. Japan and South Africa are two areas in the word where ancient Shamanic earth honouring traditions are still alive and thriving; largely unbroken for hundreds of years. This is in stark contrast to other parts of the Western world like Europe and North America. One of the fastest spreading illnesses in the Western world is depression which speaks about soul loss. Traditional earth honouring cultures can teach all of us how to remember our humanity through revering the earth and one another in a subtle, beautiful and mindful way. 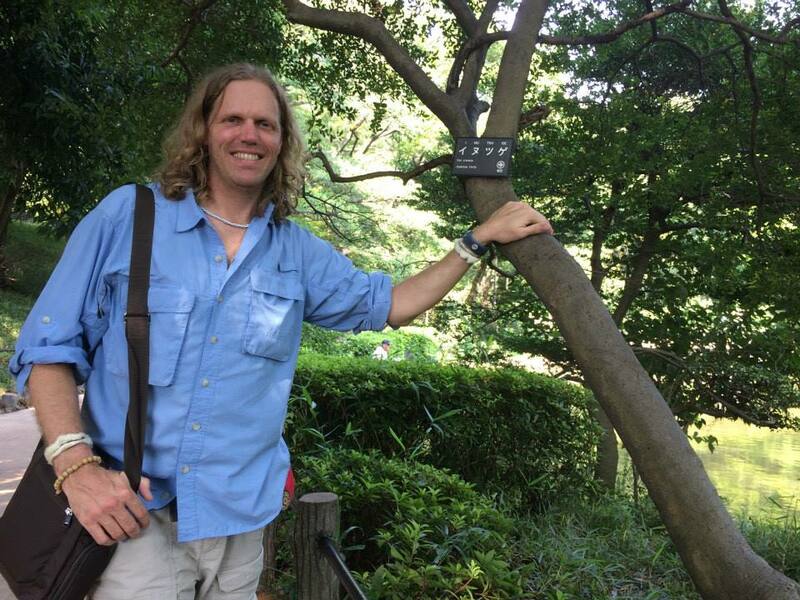 I look forward to returning to Japan again next year and to continue my world tour teaching people how to reconnect with themselves, one another and nature. There is so much life out there, from the sounds of the 'semis', to the swimming khoi, and eager faced young babies. When we breathe it all in, pause and breathe out slowly, there is no end to the wonder of this world.